You are at:Home»Uncategorized»Go big or go home. No, seriously, go home. I knew I shouldn’t have hit my Idi Amin photo quota so early in the week. Check out the fruit salad on this guy, as spotted by the This Ain’t Hell blog. I’d try to count how many ribbons he’s wearing (in addition to the Parachutist Badge and the Air Assualt Badge and the Combat Infantryman Badge and…), but I think my calculator would melt down. Did he really think nobody would say anything. Come on, first off all he does not look old enough to even be in the military, let alone a MSgt, and look at all those badges and ribbons. I am surprised he got on the base looking that ridiculous. He is a walking military clothing store!! 3 of those medals on the bottom two rows are the same medal just different variations. You’re only authorized the to wear the first one awarded. No way that is real. Come on everyone…this guy is so top secret, covert, special ops his uniform reflects the differences between the real heros and the rear area support troops. The two stars over his CIB say Iraq, Desert Storm, and Vietnam. This guy probably served in the Ia Drang Valley of death. Only the experience he recieved at Pusan during the Koran war kept him alive…and the landing at Normandy/Harpor’s Ferry duirng the civil war. This has to be a joke or a fraud. Among other things, he’s wearing a Silver Star, Bronze Star, Distinguished Flying Cross, Antarctica Service Medal, Presidential Unit Citation, what looks like a Philippine Republic PUC but without the border, various joint awards, and at least 2 or 3 UN ribbons (you’re only allowed to wear one I believe). Curiously, I don’t see an AF Longevity Service Ribbon unless it’s hidden under his lapel. I can’t exactly tell what the wings are on top, unless it’s an enlisted aircrew badge. Not to mention his hair, tie, shirt, jacket, ribbons are all a complete mess. Chuck Norris is going to be pissed when he finds out someone took his uniform. Chuck wont be pissed, he will be lucky to not be destroyed by this High Speed Hero! What about this clown, this reference, when caught he made this comment? Such an excellent written report! I have no clue how you came up with this text..it’d take me days. Well worth it though, I’d suspect. Have you considered selling banners on your website? This guy has a few ribbons arranged in the wrong place. For one the Air Force Combat Action Medal does not have a higher precedence than the Airman’s Medal, the Purple Heart, the Bronze Star (with devices?) 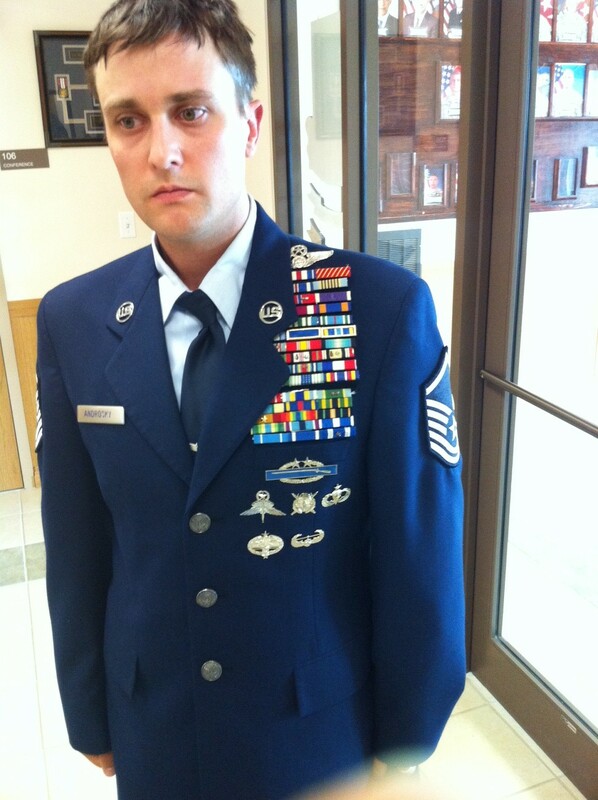 You’d think a real AF MSgt would know the proper wear of so many ribbons. I wonder if the Medal of Honor ribbon is at the top to the left of the Silver Star? I’m surprised he didn’t have general stars on the epaulets. I must have been out too long…there are no epaulets. Never knew they got rid of them from the service dress jacket. The school time for the badges alone is longer than he’s been alive.